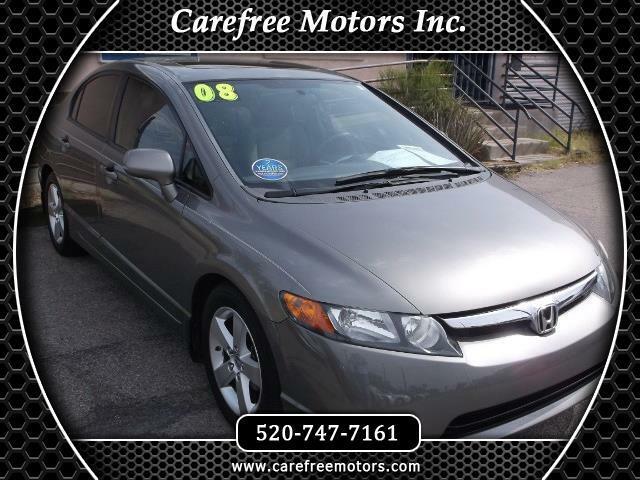 Used 2008 Honda Civic EX sedan AT for Sale in Tucson AZ 85710 Carefree Motors Inc.
Super Clean!! 2008 Honda Civic EX 4 Door Sedan, 4-Cyl, VTEC, 1.8 Liter, Automatic, 5-Speed w/Overdrive, Front Wheel Drive, ABS (4 Wheel), Keyless Entry, Air Conditioning, Power Windows, Power Door Locks, Power Steering, Power Brakes, Cruise Control, Tilt Wheel, AM/FM Stereo, CD/MP3 Player, Dual Air Bags, Side Air Bags, F&R Head Curtain Air Bags, Moon Roof, Daytime Running Lights, Alloy Wheels, Fuel City/Hwy 25/36 MPG. 97,411 Original Actual Miles $7495.00!